Gualala Robotics makes LightRail grow light movers, each as a little robot. These instrument grade robotic devises do incredible things for the indoor grow room setup. And, the same grow equipment benefits also apply to the indoor greenhouse with grow lights. These grow light system add-ons turn our grow lights into robotic grow lights. And, the benefits of these robotic grow lights are far-reaching. Plus, those grow light system benefits cannot be duplicated by any number of extra grow lights in place. And, those grow light system benefits cannot be duplicated by any number of extra on-site workers. Here is how that works. First, none of us would have multiple extra employees turning pots each and every minute. And, we wouldn’t have extra employees rotating plants closer and under the grow light as a minute by minute change. That would be a ridiculous waste of manpower. And, because of the dictates of the grow room design, it would be virtually impossible. So, this is where robotic grow lights come in. They’re up, they’re out of the way and they do what they do. Each LightRail light mover is like having a couple of extra employees doing the work that employees would never be doing. So, robotic grow lights are brilliant on this first level because they are doing something that we, as humans, can’t. Now, let’s look at how robotic grow lights beat out buying extra indoor grow lights for the grow room setup or indoor greenhouse setup. Of course, we could have a sea of grow lights throughout our indoor grow room setup. But, why would we want to do that grow light system misstep? The reality is we don’t for a variety of reasons. The first reason not to have our indoor grow lights end to end and overly abundant is that we can absolutely overdo it with our indoor plant lights. Too many stationary grow lights can actually do harm. We are forced to position these stationary grow lights too high where their power is diluted, including all the good spectrum numbers the plants need. That’s an example of Inverse Square Law where at 5 feet above the canopy, the grow light energy is cut in half. In addition to the distance of stationary grow light systems, we have canopy grow light interaction only. And, that’s in a never changing location. Conversely and by using LightRail light movers, we have each leaf surface getting its turn for grow light interaction. Closer indoor plant light and to more leaf surfaces, intermittently, is ideal for plant growth and yield numbers. That’s because the plant receptors actually open more for powerfully strong but intermittent indoor plant light. It’s the closest we have to duplicate the natural, sun-like effect that we are shooting for. In addition to the double benefit of closer and to more leaf area, we have another equally important advantage of robotic grow lights. We can now cover about 30% more area per grow light. So, when we think of the upfront costs of all of these grow lights, and their ballasts and bulbs, that’s a huge variable. Then, if we also factor in the replacement costs of those grow light systems and their electrical usage; a stationary grow light is its own monster. Plus, we’ll have extra heat with those extra grow lights in place. So, to put it bluntly, we’re doing worse and we’re paying more for that. LightRail light movers give us the benefits of turning our grow lights into robotics grow lights. And, they are instrument grade so are made for continuous duty, year after year. In addition, they save us upfront grow equipment expenses and they save electricity. That’s by covering about 30% more area, per grow light. At the same, LightRail grow light movers only use 5-9 watts of electricity, depending on the series. This is significant. But just as importantly, robotic grow lights give us much better results for growth rates and yield numbers. When we get our grow lights closer, within 2 feet of the canopy, but moving along the light mover rail, we win. With LightRail light movers, we can get 460-616 ppfd uniformly along a 6-foot (2m) canopy area at a 20-inch distance. And, we can get 338-484 ppfd uniformly along a 6-foot canopy area at a 25-inch distance. 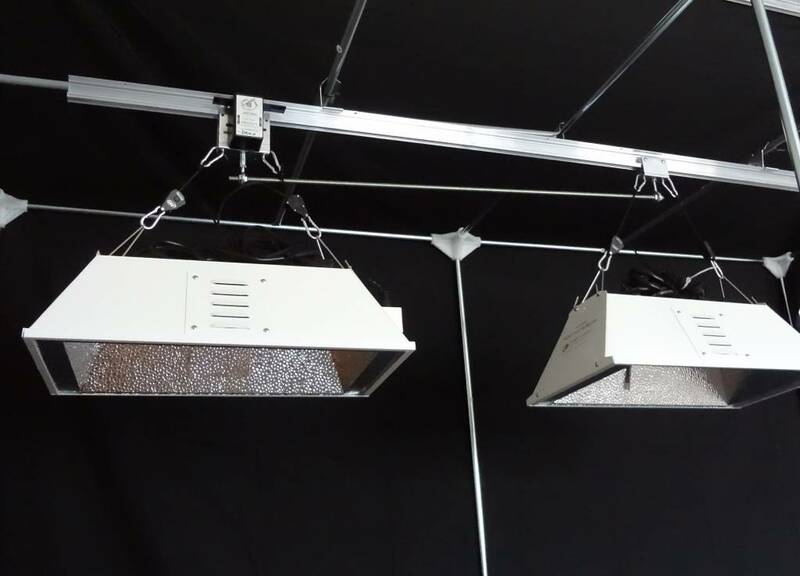 It doesn’t matter if we use two LightRail 3.5 Kits to move two grow lights parallel to each other or we use a LightRail 4.20 Kit to move two grow lights in-line. Whatever the grow room design setup, we can only get this with LightRail.